HP 951XL (CN046AN) High Yield Compatible Cyan Ink Cartridge with OEM Chip produced by the same company that makes your printer. 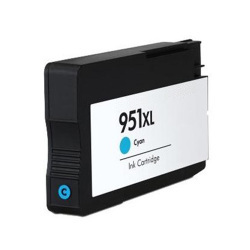 High Yield Compatible Black Ink Cartridges typically command a premium price versus their compatible and remanufactured counterparts, but have been fully certified by their original manufacturer for 100% compatibility and performance with their printers. If you're looking for maximum performance, reliability and dramatic savings, this inkjet cartridge is the choice for you. Avg Yield: 1500 pages at 5% coverage.